How much does it cost to make a soda with a SodaStream system? SodaStream is a system that consumers can use to make their own soda and seltzer water. The SodaStream machine allows the consumer to carbonate water combined with flavored syrup (“SodaMix”) to make soda in a variety of flavors. Consumers can also carbonate plain water to make seltzer water. SodaStream has been experiencing strong sales growth over the past few years, while its main competitors in the beverage market, Coke and Pepsi, have seen their sales decline. For comparison purposes, assume that a 24-pack of Pepsi or Coke soda currently costs $7.99. 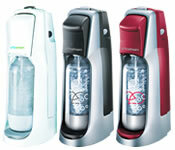 See this article for further information about SodaStream and its growth. Assume a consumer purchases the SodaStream system. What type of cost is the SodaStream soda maker (machine)? What type of cost is the carbonator refill? What type of cost is the SodaMix? Calculate the variable cost per soda made with a SodaStream system. Calculate the total cost per soda of SodaStream soda assuming that the consumer makes the equivalent of (a) 165 cans of soda; (b) 330 cans of soda; and (c) 990 cans of soda. Calculate the cost per can of Pepsi or Coke. Assume that a consumer plans to make one serving of soda per day with the SodaStream system. After a year, will this system save the consumer money over the cost of purchasing Pepsi or Coke in 24-packs? Assume that the consumer makes the calculations in Question 3 above. Upon studying the per-can costs of the 990-can level, the consumer then decides to make three servings of soda per day for a year to experience the per-can cost savings. Where is the consumer’s logic flawed in this scenario? What reason(s) might a consumer have for purchasing this system besides cost savings? How many shares of stock would be issued in LinkedIn’s $1 billion stock offering? What does the two-for-one stock split at Tractor Supply mean for shareholders? Good work! Thanks for sharing this informative content. I get more ideas from it. I am looking for Sodastream.